YOU CAN HAVE A DAZZLING SMILE! HAVE THE SMILE OF YOUR DREAMS! You deserve the smile you have always wanted. With cosmetic treatments from Dr. Zolinski, your dream smile can become a reality. Whether you need to straighten, whiten, or reshape your smile, or fill gaps or fix cracks in your teeth, the dentist will customize a plan for your needs. Enhance your smile and boost your self-confidence with porcelain veneers. This conservative treatment creates dramatic results in just a few visits, making it the treatment of choice for total smile makeovers. Dr. Zolinski will discuss the treatment with you to ensure you receive the bright, white smile you’ve always wanted. Don’t wait! Your brand new smile is just a few visits away! Enjoy a brighter, whiter smile. With a dentist directed home-whitening kit or a powerful in-office tooth whitening treatment, you can have the dazzling smile you’ve always wanted. Dr. Zolinski offers several different whitening systems, each with their own unique formulas to whiten your smile. Whether you choose Opalescense™, KöR, or Rembrandt Sapphire™, Dr. Zolinski will answer any questions you may have about the process. You can expect safe and effective results for a long lasting boost in your smile and self esteem. Ask Dr. Zolinski about a whitening solution today! Get the dazzling smile you’ve been dreaming of with Lumineers®! Like porcelain veneers, Lumineers® are a long-lasting cosmetic enhancement that is affixed to the front surfaces of your teeth. However, while traditional veneers require significant tooth preparation, the Lumineers® process is much simpler and can be more comfortable during treatment. As an added advantage that sets them apart from traditional porcelain veneers, Lumineers® are also reversible. Ask your Dr. Zolinski if Lumineers® are right for you. Straighten your teeth discreetly, without metal braces! Thanks to Invisalign®, you can now have the beautiful, straight smile you have always desired using clear, removable aligners to incrementally straighten your teeth. Invisalign’s FDA-approved system has no uncomfortable wires or brackets, and there is no need to worry about food restrictions or problems with brushing or flossing because you remove the aligners when you eat and drink. This innovation can straighten your teeth in just nine-to-15 months…without anyone knowing you are undergoing treatment! Ask Dr. Zolinski about Invisalign® today! If you have a missing tooth, a lifelike porcelain bridge can be an aesthetically pleasing solution for fixing your smile. By fusing a natural looking prosthetic tooth between a pair of crowns, Dr. Zolinski can “build a bridge” between the teeth surrounding your gap, leaving you with a great looking smile. Beyond what it does for your appearance, it’s important to note that a missing tooth can lead to serious oral health problems without treatment. Don’t wait! If you have a missing tooth, consult with Dr. Zolinski about whether a porcelain bridge could fix your smile. You can restore your smile with a natural looking porcelain crown. After removing decay from your troublesome tooth, Dr. Zolinski can provide a lasting treatment that blends seamlessly into your smile. Your custom-milled porcelain crown will look so real, no one will even know you’ve had treatment. 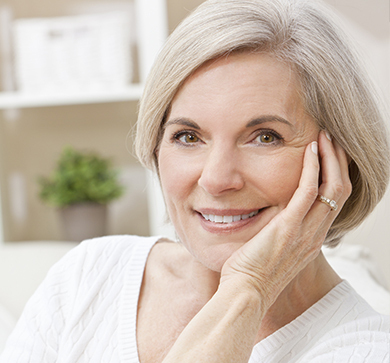 If you need a crown due to injury, decay, or simple wear and tear, try a lifelike porcelain crown from Dr. Zolinski. Trust Dr. Zolinski to repair your tooth with a filling when decay is threatening your healthy smile. This routine procedure is completed by the dentist removing the decayed portion of the tooth and filling it with inert material. While fillings have traditionally been made from precious metals, you can now take advantage of composite resin fillings that perfectly match your existing tooth structure. Your smile will look and feel as good as new with a tooth colored filling from Dr. Zolinski! For chips, cracks, or stains in your teeth, bonding is a solution with many benefits. This tooth-colored material is applied and adhered to the surface of your tooth, often without the need to reduce your tooth’s structure. Dr. Zolinski will sculpt the material so that it resembles a natural tooth. Another advantage of bonding is that it is less of an investment than porcelain veneers, though not as permanent. Talk to Dr. Zolinski about the best approach to fixing your teeth. Want to fix your “gummy” smile? Try gum contouring: a laser procedure in which Dr. Zolinski cosmetically sculpts your gum tissue. Using this amazing technology, your smile can be shaped however you choose. This procedure is great on its own, or works as an excellent final step in a total smile makeover when paired with other treatments. Ask Dr. Zolinski about gum contouring today. INJURY, POOR CARE, OR EVEN JUST YEARS OF WEAR AND TEAR CAN TAKE A TOOL ON YOUR TEETH.